I love derby so much, I love to skate, I love to hit, stop, go, run, jam, block… the whole package. I also love the women that play derby, but there are a couple of skaters where their skating, their awareness on the track and sometimes off the track just have captivated my heart and I have formed a derby crush on them. A desire to get to know them better, to skate with them, to just be someone that they want to skate with. But for all you who know me, you all know that my current and greatest derby crush is on Psychobabble from Rocky mountain, her sister is awesome and amazing in all ways, but when Psycho is on the track, I just can’t stop staring in awe at her. She is just so fantastic, I know, I know, she is just human, she paints her face like the Joker, but still, I just am in love, my crush is very serious. She skates like a maniac; she is so crazy, yet refined and precise. Her eyes twinkles when she skates and still they have a determination ‘KILL THAT JAMMER’. I probably could go on and on about how she just hit the toe stops on the right time, how she taunts the jammer, how she moves on the track like her skates were magic, but I think I probably just would start to sound silly and maybe a little stalkerish. Oh, and I just realized the other day when I was practicing that I might have a derby crush on Suzy Hotrod, but damn that girl is funny! So who is your derby crush? 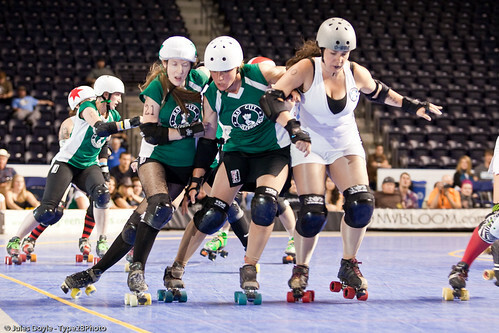 My two biggest derby crushed are Smarty Pants,TXRD and Stefani Mainey,London Brawling. They are both amazing skaters and yeah, hot. Oh I have a total crush on Psycho AND DeRanged! They are both so awesome in so many ways…and I loooove how Psycho taunts the other team…yet has the sweetest smile. And off the track? Both of them are so sweet, so soft spoken, and so lovely that you cannot believe how scary they are on the track. Like the recent photoshoot my husband did of them! (I think you saw it?) I am on the same league as them and I STILL can’t get enough of them! I will always love Siouxsiside Bomb! So many things to love! Oh, my, I probably have a hundred derby crushes! I love derby crushes!!! Definitely Blood Clottia, she is just beautiful and I love the way she skates. I fell in love with Krissy at Rollercon last year, she reminds me of a beautiful, 70′s, California surfing godess. Bonnie Thunders and OMG WTF, I have huge derby crush on both of them. Swede, I totally have a derby crush on you too! I think it’s really hard not to develop crushes. 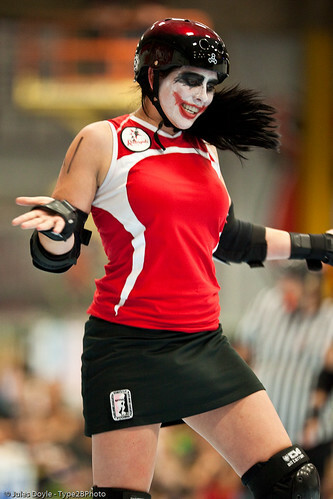 There are all these hot ladies playing derby that are super amazing, how could you not? I have a derby crush on Grave Danger from Rat City. The who damn team. And the majority of the Psychward Sirens over at HRD. I’m such a derby ho. I’m Psycho’s derby wife….. HA! I’ve yet to see Bravo skate in person, but, damn, every single photo of her is AMAZING. I have shots of her in a nerdy folder on my desktop where I keep inspiring derby photos. God, her form! Faith in Bruises Full of Meh!